Caroline Deighton is a student with Deakin University’s Museum Studies program and a Museum Accreditation Program manager with Museums Australia (Victoria). Caroline has undertaken a cataloguing project to provide adequate information and background to existing catalogue records. I just love cataloguing. There’s no better way to learn about history, uncover hidden mysteries and add vital information to the records of a museum. Whilst volunteering at the Geoffrey Kaye Museum of Anaesthetic History, I have been cataloguing a shelf of doctor’s kits. Museums spend A LOT of time cataloguing their objects. Very early on as museum studies students we are taught the importance of identifying provenance, researching, documenting, and condition reporting our objects. These are important functions of caring for cultural collections and the catalogue is our toolkit. Unfortunately, many museums hold objects where there was little provenance information or documentation completed at the time of donation. This means that the keen Collection Managers and Registrars of today are left with a legacy of updating what are sometimes very empty records. In order to make collections useful, museums have to manage records about their objects. It is essential for building a body of knowledge about a collection, for exhibition development, and as a way of allowing more people to access collections, museums are putting more and more of their catalogues online. Collections without adequate information are little more than picture books. So back to my shelf of medical cases. On this one shelf at the museum there are six medical kits. They are different in size and shape, and due to their condition and style, look to be of different ages. Who used them? How old are they? How did they come to be in the museum? Why do they matter? I put on some nitrile gloves, carefully open the first case and wonder what I am going to find. The first case I work on contains a gorgeous little bottle with sealant at the neck and a paper label that tells me it was used to hold ethyl chloride, and even has a date of 1932. 1932! Already my heart is pounding. This is great. 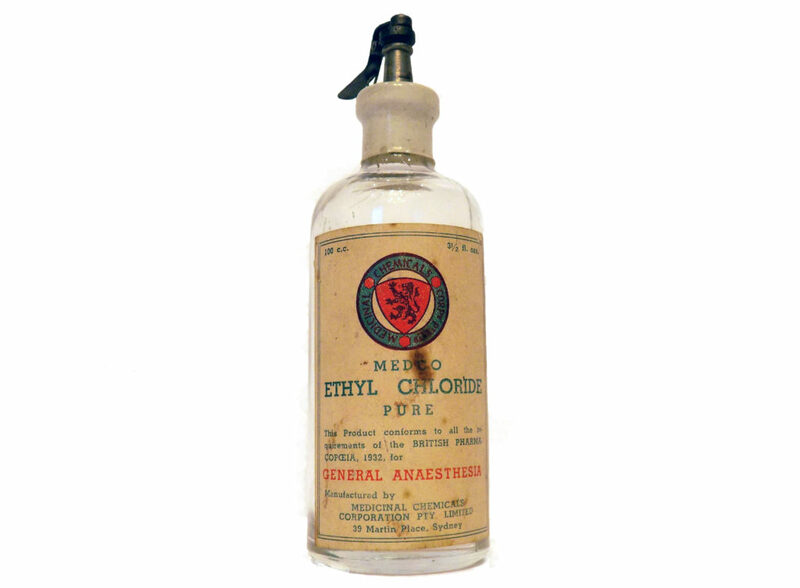 After a bit of research I learn ethyl chloride was first used as a general anaesthetic in 1847 by a German surgeon Johann Ferdinand Heyfelder and once its use was widespread it was favoured due to its rapid onset. It became popular as an agent for the induction of anaesthesia and the anaesthetic was then continued with ether. According to Dr W. R Fuller, this technique remained popular right up until the 1960s. Fantastic! I am learning a little about the history of anaesthesia, not just the object in front of me. But what interests me personally about this particular bottle is just how pleasing to the eye it is, the effort made in designing and printing the label, the lovely shape of the glass. I do a little more digging and think about how something as attractive as this would have been made. While looking for inscriptions, I notice that the bottle has some barely visible seams on the side and base. I’d never looked so closely at a glass bottle to really notice. But as it turns out there are people who can date a bottle by looking at its seams, and this little bottle looks as though it was made in a two-piece “cup bottom” mold. If I didn’t already have a date on the label, this type of research might help me to date it. I open the next kit, it contains an inhaler, a glass bottle and a pourer. This object dates to c1895 and is not in great condition. The museum’s curator explains to me the way inhalers such as this were used, and carefully demonstrates where the mask would have connected and how the pourer would be used to administer the anaesthetic. One early version of inhalers was a Clover portable ether inhaler, designed by the incredible anaesthetist Joseph Clover (1825-1882). 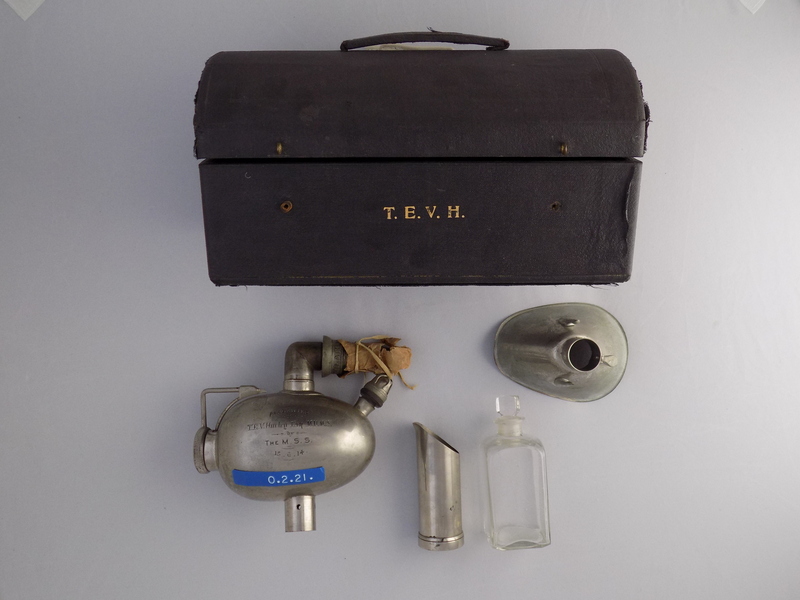 The inhaler in this medical kit is a modified version of the Clover inhaler, which was modified by Sir Frederic W Hewitt (1857-1916), an accomplished and well respected English anaesthetist. Dr Hewitt introduced changes to the Clover Inhaler in order to make it easier to breathe through the device and improve the ventilation of oxygen and carbon dioxide. It was often referred to as the Hewitt Wide-Bore Inhaler. In 1901, Hewitt was recruited to anaesthetise King Edward VII for emergency abdominal surgery. This was just a day or so before the new King was to be crowned. The King recovered well and Hewitt became the first anaesthetist ever to be knighted. 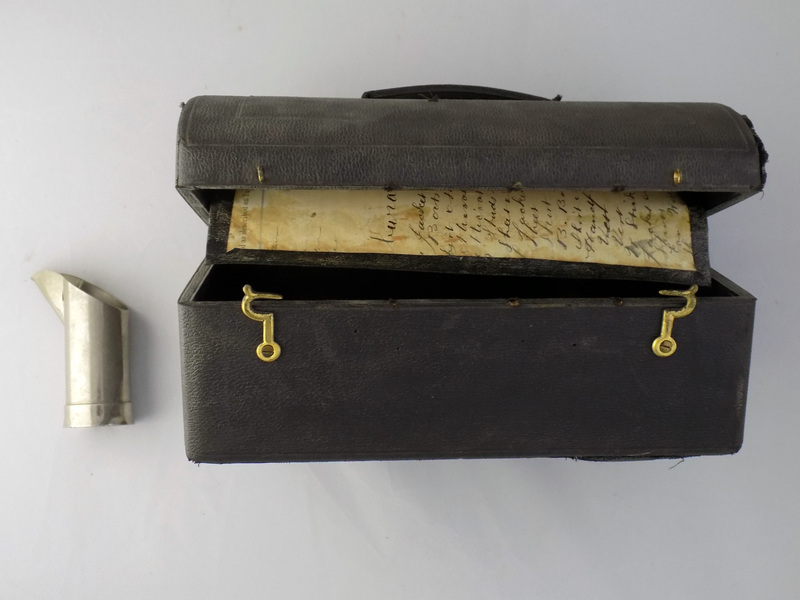 The catalogue states this object kit was donated by Dr E S Holloway, who acquired much of Dr Howard Jones’ (‘of spinal anaesthesia fame’) equipment. 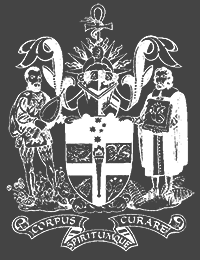 After further research I learned that in 1930 Dr Howard Jones, M.B., B.S., (Lond.) was a Surgeon Anaesthetist to Charing Cross Hospital. He was also the first honorary secretary of the Association of Great Britain and Ireland and a leading practitioner in his day. Apparently he committed suicide in 1935, there are references that he “could not make a living from anaesthesia”. Wow! Now I am getting an insight into some of the ways medical objects can come into museum collections, the difficulties of life for some past practitioners and stories of the amazing careers of these anaesthetists. Even before we open this case it is exciting. On the front are the letters T.E.V. H. printed in gold leaf. Occasionally these doctors’ kits have a name on them, which helps to identify the owner and assists in confirming provenance. Another fellow volunteer has completed a significance assessment on this object. As I open the next medical kit I actually have a moment of disappointment. 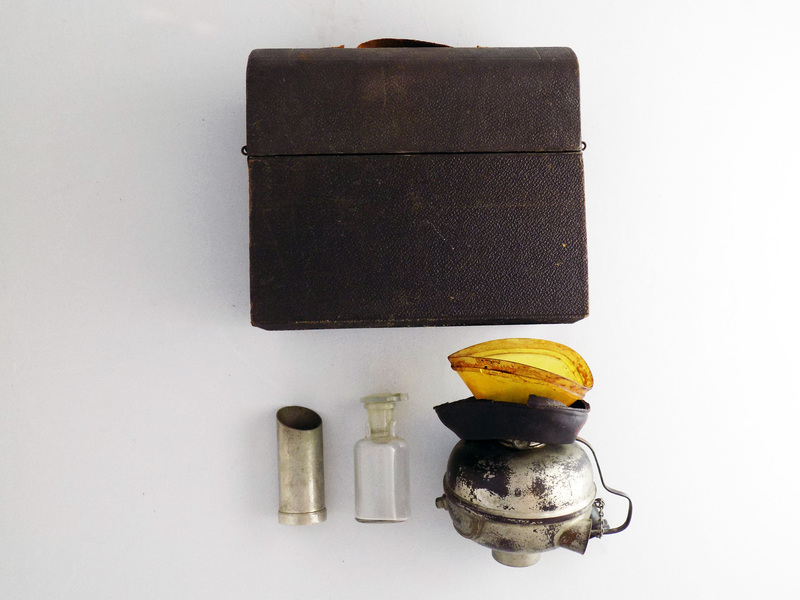 This case is empty except for the metal pourer often used to pour ether into an inhaler and the characteristic square section inside the box to hold the bottle of ether. But as I open the lid further the lining of the inside of the lid falls down. Behind the lining is scrawly handwriting ‘Pawn-Ticket / January 1903 / Jacket / Boots [cont…]’ It looks as though the manufacturer, Mayer & Meltzer, has reused old listings from a pawn shop and covered this paper with black linen to create the case! What an ingenious way to reuse materials. Objects in our museums are important. They have been collected, catalogued and researched for generations. They have been identified as culturally significant for our communities. The Geoffrey Kaye Museum holds a unique collection which demonstrates the history of the practice of anaesthesia in Australia and New Zealand. By spending time carefully handling, documenting and researching these objects a museum studies student or anyone interested in medical history can learn even more about the materials, manufacturers, the personalities and the development of anaesthesia. It also ensures that these collections will be available for research purposes in the future, and by using online avenues such as Victorian Collections, brings these objects to a wider audience. Cataloguing is not only an opportunity to gain practical experience in an area of core museum work, but also a way to make a lasting contribution to expand our knowledge of this unique collection for future generations.